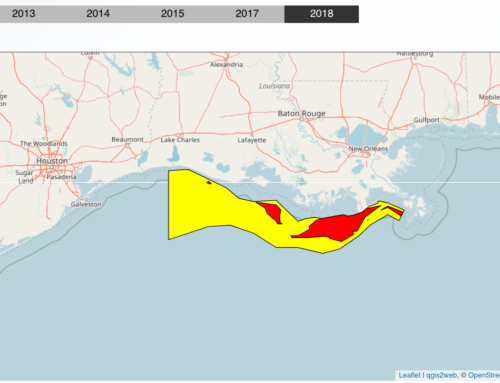 The coast wide extent of the Louisiana “dead zone” mapped this week is 11,840 square kilometers (or 4,564 square miles), slightly smaller than the size of Connecticut, reported Dr. Nancy Rabalais, Chief Scientist for Northern Gulf of Mexico Hypoxia Studies. The low oxygen waters extended from near the Mississippi River to the Louisiana/Texas border. 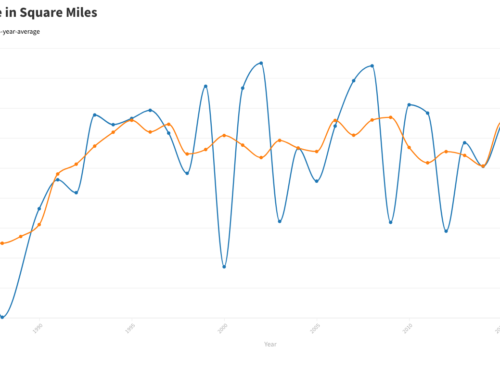 The long-term average since mapping began in 1985 is 12,700 km2 (or 4,800 square miles). The scientific word for the commonly named Dead Zone is `hypoxia,’ or low oxygen, which results in the failure to capture fish, shrimp, and crabs in bottom-dragging trawls when the oxygen falls below the critical level of 2 ppm. Higher in the water column and on both inshore and offshore sides of the hypoxic area, there is sufficient oxygen to support sizeable numbers of fish. The net result, however, is a sizeable stretch of the Louisiana coast unsuitable for supporting fish and shrimp. The seasonal formation and persistence of hypoxia are influenced by the discharges and nutrient loads of the Mississippi and Atchafalaya rivers. The fresher water forms a layer above the saltier Gulf waters. Nitrogen and phosphorus in the river water stimulate the growth of microscopic plants, the phytoplankton. These algae are either transferred into the food web or end up as organic debris on the sea floor. Their decomposition by bacteria depletes oxygen in the lower waters until they no longer sustain the life of most marine animals. Water depths affected were as shallow as 20 feet and as deep as 85 feet. The hypoxic zone was smaller between the Mississippi River and the Atchafalaya on the central Louisiana coast than between the Atchafalaya River delta and Calcasieu estuary to the west. 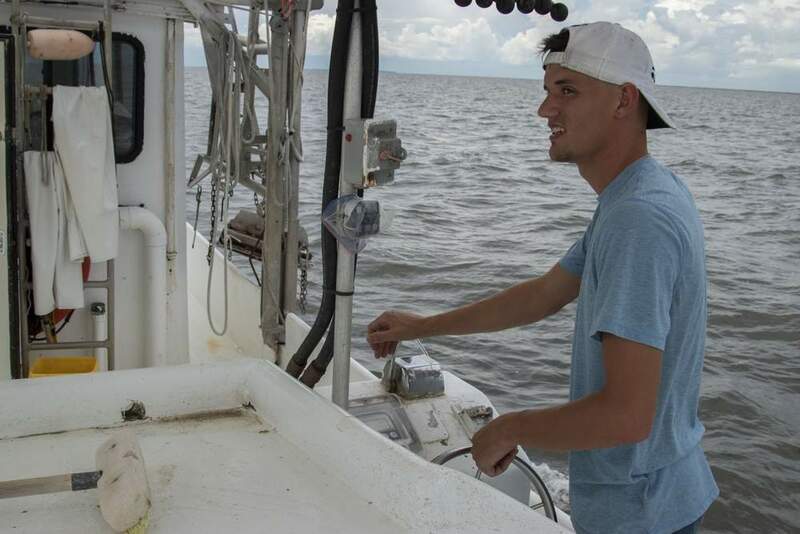 Steve DiMarco and colleagues at Texas A&M University and also the National Marine Fisheries Service groundfish survey both conducted cruises in the area Louisiana hypoxia in early July before the landfall of Hurricane Dennis on the Florida coast. Their sampling grids were limited to the southwestern Louisiana shelf, but they also found hypoxia between the Atchafalaya River and the Calcasieu estuary. The size just mapped was smaller than predicted using a model developed by Dr. Eugene Turner of Louisiana State University, an investigator of the research team, that relates the size with the May nitrate load along with a term that adds the influence of the previous year’s nitrate load. Turner predicted a size of 6,200 square miles, which was larger than the measured size of 4,800 square miles. 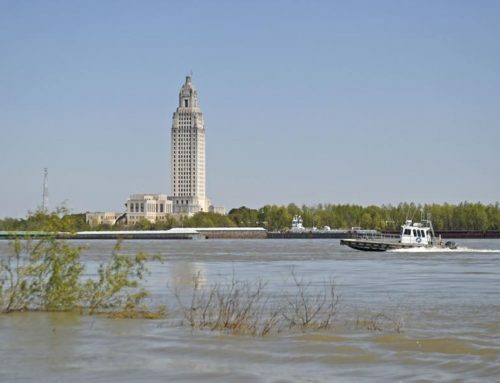 The smaller than predicted size was expected because of a tropical storm and hurricane that affected the area between the Mississippi and the Atchafalaya rivers earlier in July. While the two-layered system that supports the formation of hypoxia was redeveloping at the time of the mapping cruise, the oxygen level beneath that layer had not fallen below 2 ppm again. 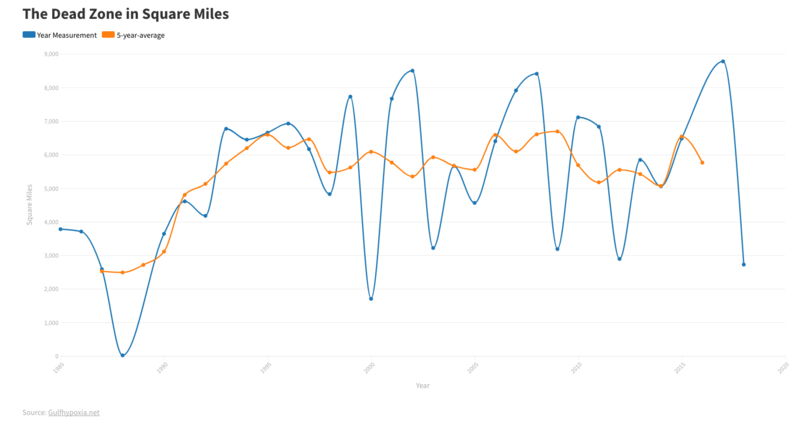 “I would predict that a somewhat larger area of hypoxia would have been mapped if the cruise had been conducted one week later than planned and therefore closer to the size modeled by Turner,” said Rabalais. 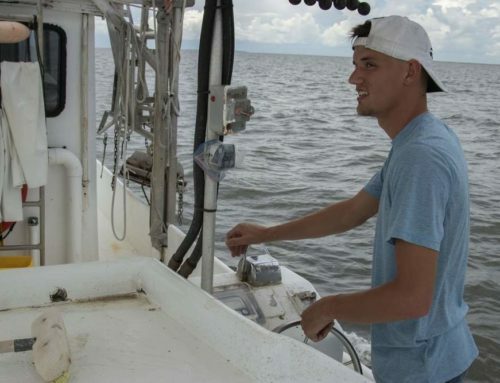 Confirmation of this prediction may come from the oxygen measurements taken by the NMFS groundfish survey that finished their work on the southeast Louisiana coast on July 27 – August 31. 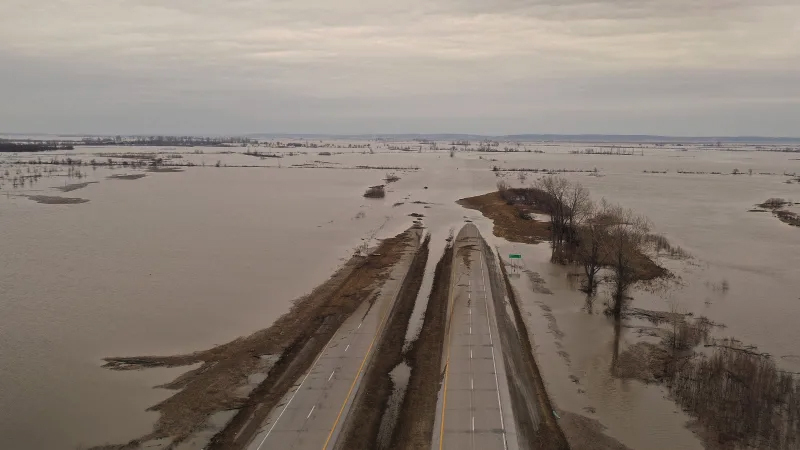 Scientists from the National Atmospheric and Oceanic Administration predicted this summer’s dead zone to be less than 1,400 square miles based on nutrient loads from the Mississippi and Atchafalaya rivers in May and June. 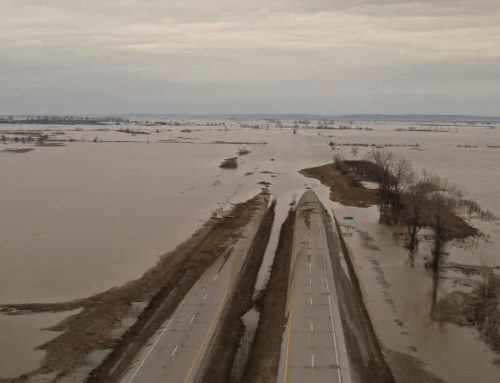 While high in late winter and early spring, the nutrient loads were lower than average this year, probably due to below average precipitation across much of the Mississippi River Basin. The multiple models will help evaluate the influence of the nitrogen load and variations in the physical structure of the offshore coastal waters to improve assessments of hypoxia. Additional research conducted on the cruise was focused on the effects of varying levels of hypoxia in controlling mercury methylation in bottom sediments. These studies were conducted by Dr. David Senn, Harvard School of Public Health, and funded by NOAA’s initiative on Oceans and Human Health. 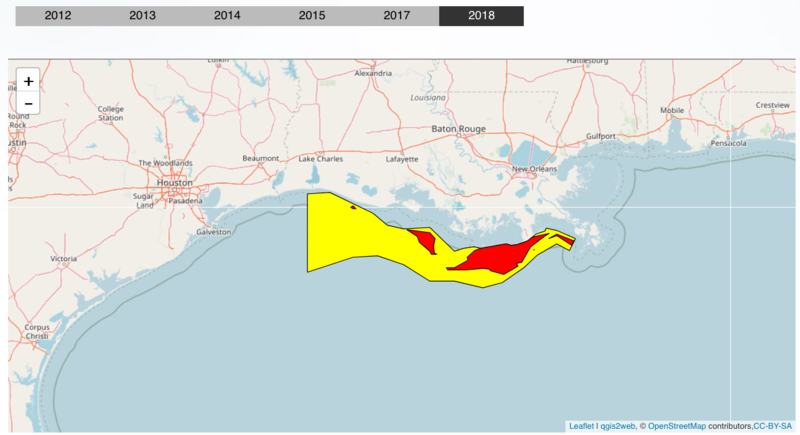 The scientific party that mapped this year’s zone was from LUMCON, LSU, Harvard School of Public Health, and Nicholls State University, and was funded by NOAA’s Center for Sponsored Coastal Ocean Research, part of the Ocean Service’s National Centers for Coastal Ocean Science. The mapping was conducted from July 24-29 from aboard the research vessel, Pelican. For further information contact Dr. Nancy Rabalais, LUMCON, 985-851-2801, nrabalais@lumcon.edu.